After 2011's "Dark of the Moon" will come the "Age of Extinction" for Michael Bay's "Transformers" franchise. The director has previously revealed that "Age of Extinction," the fourth film in the series, takes place four years after the war in Chicago when the "Autobots and Decepticons have all but vanished from the face of the planet." Yahoo! Movies thinks that the new title - and its accompanying sandy poster - hint that "Transformers 4" will bring out the Dinobots. While Bay hasn't mentioned anything about them, he has clarified that this film will mark a transition from the initial trilogy. To begin with, "Age of Extinction" will feature a new leading man after Shia LaBeouf decided he wanted to exit the franchise after 2011's "Dark of the Moon." Instead, fans'll get Mark Wahlberg leading a cast that includes newcomer Jack Reynor. "The story makes a very natural transition, and reason as to why we have a whole new cast," Bay has said. "This 'Transformers' will feel very different than the last three. We are embarking on a new trilogy." Along for the ride are Stanley Tucci, Kelsey Grammer and Nicola Peltz. 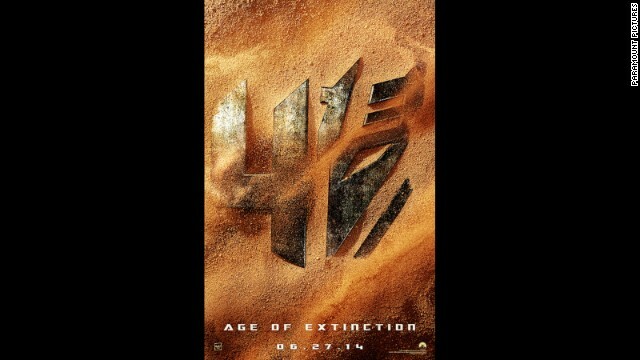 "Transformers: Age of Extinction" opens June 27, 2014. « Previous entryJon Stewart returns to 'Daily Show': He's baaaaack! This change in cast, a desperate attempt to keep a franchise going? Fans will be Fans, but this cast is weak compared to what the series demands. That poster is terrible. It looks like a giant sponge toffee. that is why she's wired in. I couldn't even sit through the first one of these Tranformers films. I guess it is only for children under 10 years of age. The voices of those huge machines were so bad, and how they attempoted to make a giant robot into a "lovable" funny character!? Are you kidding me? Bay has hit one new low after another and this new Transformers film will likely follow that trend. Easily amongst the worst movies I've ever seen. The 1st one was almost tolerable, as Shia can be quite a funny guy. But the dialog was simply a joke. The 2nd movie was painful to watch.....I walked out on that one......and it was playing in my own basement!! And yet Bay makes a killing on these movies. They're just fine and apparently they will continue to make more money. anyone that hopes for "big time, oscar-winning performances" from a kids movie featuring gigantic transforming robots is just setting themselves up for failure with unrealistic expectations. Its just dumb fun full of explosions. Kind of like the new Expendables franchise by Stallone. M.A.P Has No Taste In Movies. The Transformer movies were just fine, before you hate on a movie you really should learn how to use proper grammar. As well as learn how to spell. But the Transformers franchise has died down a tad bit, the Transformers 4 will hopefully bring back the greatness that Bay once had. What does hating on a movie have to do with grammar? You should learn how to form formiddable sentences that relate to the subject matter before making a fool of yourself – Michael Bay fan? Really? I am supposed to have bad taste in movies and you are openly admitting you are a Michael Bay fan? He doesn't even write stories – just CGI sequences. We have some serious spammers on this site. I keep clicking 'report abuse' every time I see their posts. One person is posting huge, very long posts full of nonsense. Another keeps advertising dating sites. Keep reporting it and maybe we can get them off here for good. Unicron, Galvatron, and yes, Rodimus Prime. The animated movie from 1986 is being used as a reference.